I wanted to create modern day version of the goddess of compassion and mercy, Quan Yin. In the "Jewel In The Lotus", I have given the dragon a loveable dog-like quality. My spiny lizard Marco (see wildlife gallery) was the model for the dragon's eye and his character. The uniquely glazed background tiles in my mosaic and the metallic golden spirals surrounding her represent the universe and all good energy that she attracts. 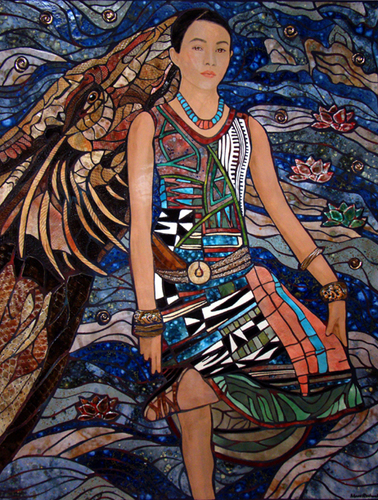 The tiles in Quan Yin's dress have elements of earth, heaven, water, mineral and vegetation. The name "Jewel In The Lotus" pertains to Quan Yin's mantra, "Om Mani Padme Hum". It is the universal mantra of love and compassion. It is translated as, "Hail the jewel in the lotus".